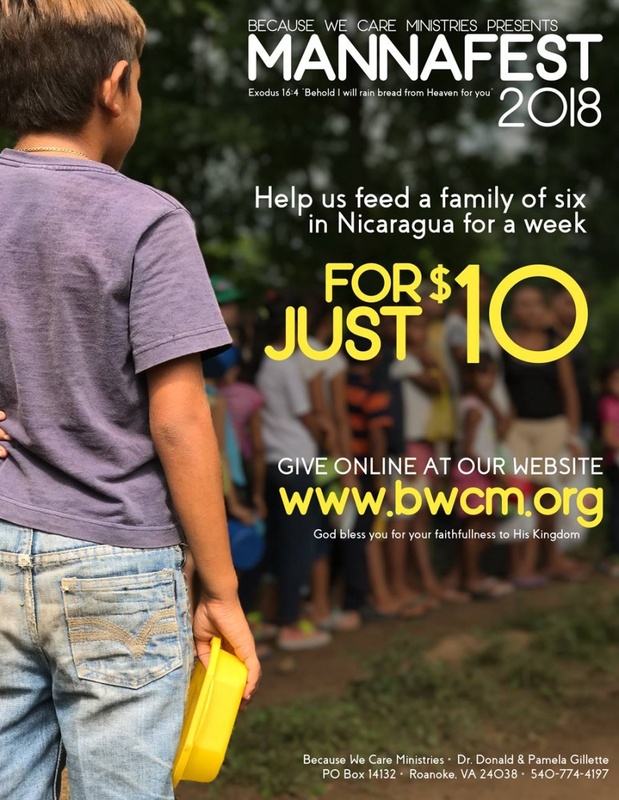 Blessings from Somotillo Nicaragua……I just got the monthly report from Kroger and they stated that not one family that was supportin BWCM purchased anything from them through the last quarter. Also, they informed me that they are making some changes to their system and we now have a new number, which is IP978. Please go to Kroger community rewards and register your Kroger plus card and help support BWCM. We truly need your support now more than ever. Please pass this on to your family and friends. May God richly bless you and yours. Good morning and blessings……We have started our "Manna Fest" drive a little early this year as the demands on the ministry have increase so much. I’m sure you have heard of the civil unrest that has been going on since early April in Nicaragua. Unfortunately when there is any kind of civil unrest in any country the poor, widows and orphans suffer the most. Along with the Mana Fest program we are praying and planning to continue our daily village ministry of feeding, medical and evangelism. Blessings to all…..Can you believe its that time of the year again to start our "Manna Fest" drive for 2018. Because of the "civil unrest" its going to be necessary to continue the feeding program on a daily bases. The last I heard more than 1.5 million people have lost their jobs and 25,000 have crossed the border into Costa Rica. 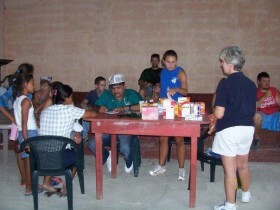 I thank God for our team that is working to meet the needs daily for the families in the villages we serve. We will still be doing the Christmas "Manna Fest" but really need your support for the coming weeks and months. Why bother? What is the point of short-term mission trips? Has anyone wondered this before? I remember thinking those thoughts. What difference can be made in a week? Isn’t there enough work to be done here? I prayed about these things before we left. My son asked, "If there are teams there all the time, what impact will we have?" Good question. As we prayed about it, it became very clear. First, realize that it is not about me or you. As Christians, we are called to reach the nations. It is about God and the bigger picture. We were with an organization called Because We Care Ministries. 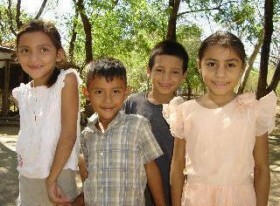 This organization has been serving Somotillo, Chinandega, Nicaragua and surrounding areas for 18 years. 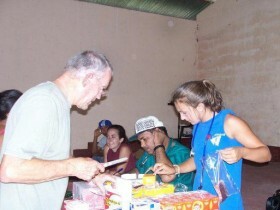 The teams travel to villages, build churches, own a school and provide for many other schools, sponsor a Christian radio station (which reaches three countries), provides a clinic and brings medical help to the villages, serves meals and loves on the people. We often hear that it is all about the relationship. It is about getting to know the people and earning the right to be heard. If someone came knocking on my door to even bring me food or play with my kids, I would send them away if I did not know them. The week long teams, along with trusted translators and long term missionaries, build the relationships for the larger organization. We are the hands and feet. We are trusted because of the many missionaries who came before us who built relationships for us and we build relationships for others. Because of these "linked" relationships it is like one big hug or road connecting the people. When communities of people see the trucks, they come running. Children head to the streets. Villages that trucks would not feel safe stopping in because of the violence before, now have schools and churches. Little by little the many links form a beautiful road where God is glorified and people are loved and saved. When you are being obedient, you may be a link or you may be the final message. Going, even short-term, is actually biblical. I was surprised to find what I was looking for in Jonah. Jonah was not exactly someone you would think of as a good example. He was rebellious, hard-hearted, stubborn and even judgmental. But God gave him a second chance to obey. Jonah 3:1-5, "Then the word of the Lord came to Jonah a second time: “Go to the great city of Nineveh and proclaim to it the message I give you.” Jonah obeyed the word of the Lord and went to Nineveh. Now Nineveh was a very large city; it took three days to go through it. 4 Jonah began by going a day’s journey into the city, proclaiming, “Forty more days and Nineveh will be overthrown.” 5 The Ninevites believed God." Jonah was only there for a short period of time. He spoke one sentence and the entire city was saved. Don’t underestimate the plans of God even if it is only a week. Yes, there is work to be done here and there are groups doing work here too. But when you see the poverty, neglect, and hardships of these people first hand, you would want to go to them too. Not enough Christians are going out of fear — which there was no cause for. Here is what I do know about our week. We loved on others… a lot, we saw many pray to accept Christ, we feed them and shared our stories. If nothing else we were another link and we don’t underestimate the greater plan. And, in the process, God found a way to change us, bless us, and shape us into something more. YOU STILL HAVE TIME TO JOIN THIS TEAM…….